Rarely does one see Sunny Deal sharing a photo from his personal life. 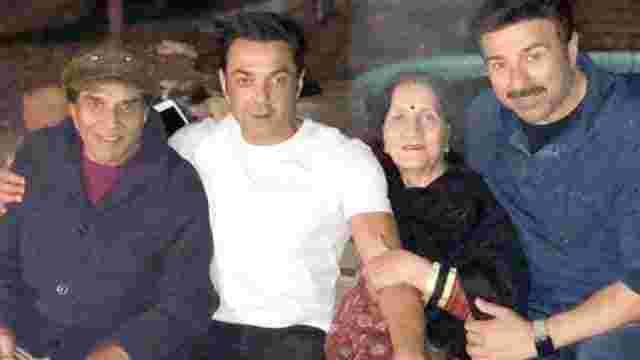 The Gadar: Ek Prem Katha actor took to his Instagram account to share an adorable picture with his mother Prakash Kaur. The picture describes their love and the adorable mother-son bond. Sunny Deol shared the photo and summed her existence in his life in just few words: "My mom my world [sic]." Not just Sunny's mother, even his wife Pooja Deol and sisters Vijeita and Ajeita Deol too stay away from the limelight. Meanwhile, on the work front, Sunny was seen in three movies in 2018 namely Yamla Pagla Deewana: Phir Se, Mohalla Assi and Bhaiaji Superhit. Currently, he is gearing up for his directorial titled Pal Pal Dil Ke Paas. This film marks the acting debut of Sunny's son Karan Deol on the big screen. The movie stars Saher Bamba as the female lead. It is likely to hit the screens this year. The 2:10 minutes song titled, ‘Mungda’ is a recreated version of Usha Mangeshkar's hit 70's song from the movie, ‘Inkaar’. Mrunal Thakur, who started her career with television but moved on to films and web series, says it is important for an actor to avoid getting into a comfort zone. The actor, who carved a niche by featuring in off-beat films, said he doesn't care about box office validation but if an actor's talent is measured in numbers, he can play the game too.